Finally, an all-natural thyroid support that's actually effective. 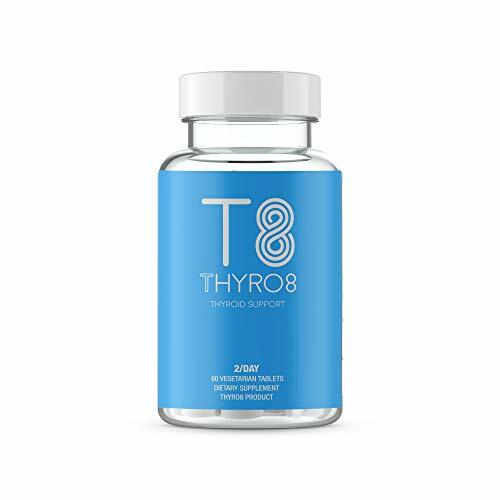 Thyro8 is your complete thyroid support system that provides the perfect blend of natural ingredients that restores your mind and body, guaranteed, without the awful side effects. Thyro8 was formulated to help relieve all of the symptoms associated with an underactive thyroid. If you're fed up with prescription drugs and natural supplements that don't work, Thyro8 has you covered. The ingredients in the T8 Power Blend were tested for several months and carefully chosen. Each natural ingredient helps alleviate at least one symptom of an underactive thyroid. Thyro8 can improve energy, metabolism, focus, hair strength, hormonal imbalance, poor circulation, mood, and dry skin. L-Seleniumethionine - Research has shown that this important antioxidant mineral has multiple benefits, including boosting healthy th yroid function. Hydroxytyrosol Acetate - Naturally found in the olive leaf and well known for its cognitive benefits. It also has a long list of advantages, including boosting your metabolism, mood, and energy. Guggulsterone Extract - A product of the guggul tree, Guggulsterone increases thyroid function and boosts metabolism. Theobromine - You may recognize this ingredient because it can be found in the cocoa plant. Theobromine is one of the reasons chocolate has mood-elevating effects. Potassium Iodide - Iodine is essential for the normal growth and development of the body, but iodine comes entirely from your diet. If you do not consume enough iodine, it can lead to serious health problems, including an underactive thyroid. Vitamin K2 - This ingredient improves brain function and helps with circulation. ENABLE BETTER THYROID HORMONE FUNCTION - Focus on what matters, focus on a healthier thyroid hormone level with our proprietary thyroid complex. Don't complicate your purchase, we offer complete support & have proven and tested our ingredients for optimal thyroid hormone levels. BOOST ENERGY & SENSE OF WELL BEING - Sick of sluggish, low energy from something you can't control? You can control it, with T8's thyroid formula - we will have you waking up feeling more refreshed and re-energized than you've felt in forever! IMPROVE FOCUS & ELIMINATE BRAIN FOG - Eliminate 'brain fog' and a lack of clarity with our tested formula for thyroid function. Improving thyroid performance is shown to boost concentration and improve memory. EFFECTIVE & SAFE THYROID SUPPORT FORMULA - Improving your thyroid function can assist with weight loss through proper diet and exercise and we've researched our ingredients to ensure it is not only effective but safe. Some of our ingredients include Vitamin K12, Iodine, Guggulsterone extract, L-Seleniumethionine, and more. THYRO8 100% MONEY BACK GUARANTEE - Experience a new normal with Thyro 8 premium thyroid hormone support supplement. We are so confident in our product and research that if you don't like it simply reach out and we will provide you with our 100% money back gaurantee. If you have any questions about this product by Thyroid Essentials, contact us by completing and submitting the form below. If you are looking for a specif part number, please include it with your message.